A relative passed away recently… or should I say in the future? See the official government death certificate issued, which shows a particular date. What do you interpret that date as? In India, as we follow the British system, most people would interpret this as 9 December, 2016 (09/12/16). But she passed on 12 September, 2016. Is this a big deal? What went wrong? When family members asked the officials why the date was wrong, the answer was that it’s not wrong, this is how our system is set up. They also not only refused to issue another death certificate, but also said they couldn’t issue such a death certificate (one showing 12/09/16). Getting a date wrong on something as important as life or death isn’t just an accounting issue; it can impact things ranging from insurance to pension or more. If one is being dramatic, it can impact the deceased’s will, or even police investigations. “Little things” can actually cause major issues, even death, such as if a doctor’s handwriting is misread, resulting in incorrect medicines or dosages. In the case of the $125 million Mars Orbiter, confusion about units of measurement (metric versus imperial) led to its crash in 1999. While in an ideal world we wouldn’t even make such “little mistakes”, let’s be realistic and formalise mechanisms to recognise, address and fix such things. The first challenge is we don’t know whom to complain to. The person handing over the death certificate didn’t really know what to do, or really care. Tweeting at the minister, which seems to work with a few proactive ministers (such as in the railways or external affairs), isn’t a scalable solution. Bureaucracy must institutionalise the fact that the person querying isn’t a trouble-maker, and there must be someone empowered with whom anyone can raise issues. If a particular institution doesn’t have such an ombudsman, then there needs to be a separate entity for the same, at the local, state and national levels. Not only should the respondent take steps to help fix the problem for the person raising the concern, they have to give a timeline for the resolution. 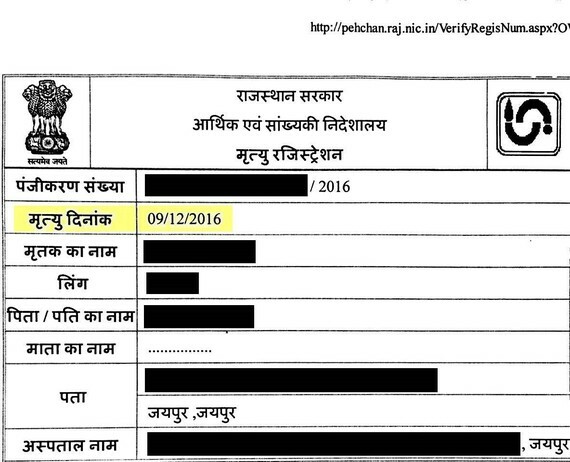 Ideally, just like an RTI, there should even be accountability. Many interim solutions aren’t that hard. In this particular case, either one needs an amended/corrected death certificate (maybe let’s just write out September instead of using numbers), or the form itself could clarify whether it is MM/DD/YYYY versus DD/MM/YYYY. Alternatively, we might need an add-on certificate that clarifies the format. Such a clarification should be issued to everyone who receives such a wrong-dated death certificate, or it could be a blanket letter available on the website. This may take time, including changing the software, but it still needs to be done. The cause of the error was possibly the fact that the software was American. Or — and this would not be the first time — it may be something as simple as a misconfiguration of the settings (!). Of course, the person handing over the certificate isn’t the one who built the system, and may not even have a means to “fix” the problem. But this is where we have to demand an appropriate solution. If a solution is imported, it should conform to Indian requirements. Fixing things after the fact is both difficult (especially for something in use day-to-day) and more expensive. There may not even be an additional budget for this. Far better would be to go through using IT terminology, alpha and beta testing of proposed solutions (testing in-house and with outsiders/actual users). Maybe even the users of the system are frustrated with their systems, about some “mindless software”. We can’t expect them to reprogramme software, but they should at least be a part of the solution. In times of grief, sometimes we can find solace in satire, like in the Dilbert cartoon below showing one mechanism for “fixing” errors. DILBERT © 1990 Scott Adams. Used with permission of UNIVERSAL UCLICK. All rights reserved. India has grand ambitions for Digital India. We need to ensure that “digital” doesn’t just mean digitised old systems but new, improved, and efficient systems. Else, with bad data, configurations or assumptions, we risk yet more headaches, maybe even leading to GIGO (Garbage In, Garbage Out). In the past, I’ve written about the need for a Ministry of Common Sense. Maybe we need a Ministry of Fixing Things as well. No, they wouldn’t repair potholes, they would ensure that whatever rules, regulations, and formalities exist, are working, effective, and remove any instances of catch-22, or “little mistakes” like the one shown above. This article first appeared in The Huffington Post, India on 21 November 2016. Like other products of the Brookings Institution India Center, this report is intended to contribute to discussion and stimulate debate on important issues.